Apple iPhone 5C is new budget iPhone | What Hi-Fi? At an event held at its company headquarters in Cupertino, California, Apple confirmed the existence of a cheaper version of its popular smartphone range, the iPhone 5C – and the end of the iPhone 5. Combating competition from Samsung, the iPhone 5C has been conceived with cost in mind, though with the iPhone 5C price set at £469 for 16GB model and £549 for the 32GB model, it's hardly a budget phone. Billed as "the most colourful iPhone yet", the iPhone 5C is available in a variety of bright, new colours and has a UK release date of September 20th, with pre-order available for the 5C from this Friday September 13th. 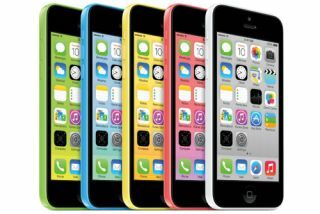 The iPhone 5C sports a plastic backing, a cheaper alternative to the iPhone 5's aluminium body. The body is bulkier, with the back and sides of the body made from a single part. And, not too dissimilar to the iPod nano range, it comes in bright green, white, blue, pink and yellow colours. The new iPhone 5C is made from "a single, hard-coated polycarbonate body with steel reinforced frame for a solid, sturdy feel". This doubles as the iPhone 5C's multiband antenna. To complement the new design, there are "soft, matt, microfibre-lined cases", designed to contrast and obviously protect the iPhone 5C's body. These are also in bright colours, a break for the norm for the Apple iPhone, and will cost £25 each. The screen has been left relatively untouched, with the iPhone 5's 4 inch full-touch, Retina display carrying over to the 5C. The iPhone 5C matches the iPhone 5 in terms of features but of course comes with the brand new iOS 7 operating system, with new features including iTunes Radio. It's an LTE 4G phone, as well as wi-fi of course, with support for 3G and 4G in the UK. It has Bluetooth 4.0, too. The battery life is up to ten hours of talk time on 3G, ten hours of web browsing on wi-fi and LTE, ten hours video playback and 40 hours of audio. Again, much like the screen, the 5C will feature much of the innards that currently make up the iPhone 5. Storage capacity options begin at 16GB version, with a 32GB model completing the line-up. It also comes with the same A6 processor in the iPhone 5. Sir Jonathan Ive's redesigned iOS 7 will be featured in the 5C, with the visual overhaul in tow. Improvements to the OS include a more convenient search function, better voice recognition through Siri and the release of Apple's streaming service, iTunes Radio. iOS 7 is out, for free, on September 18th. The camera has the same 8MP iSight camera but a new Facetime HD, front-facing camera that's designed to be better in lowlight conditions. The iPhone 5C costs £469 for 16GB model and £549 for the 32GB model on SIM-free deals. Contracts are expected. Cheap, it ain't. Available in a variety of bright, new colours the iPhone 5C will be available in the UK on September 20th, with pre-order available for the 5C from this Friday September 13th.